This should scare the wits out of Americans of every partisanship and ideology. Most Americans had not thought much—or, for that matter, heard much—about Australian Prime Minister Malcolm Turnbull. 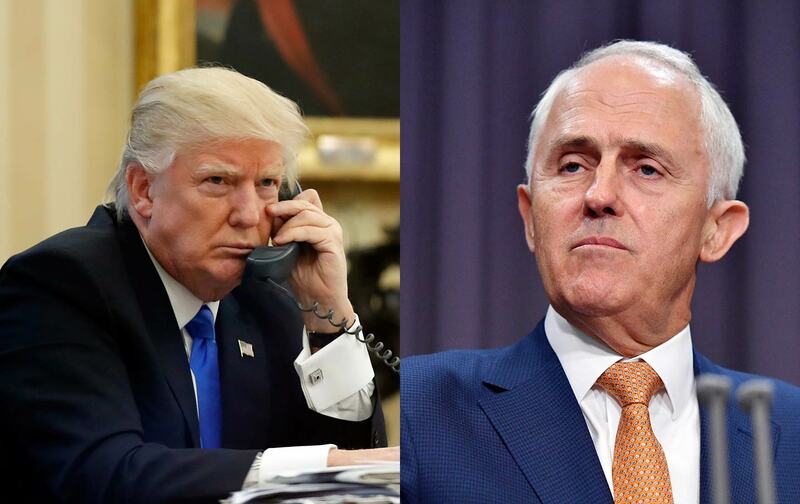 Then Donald Trump went nuts on Turnbull, reportedly cutting short a Saturday phone conversation with the leader of one of the closest allies of the United States over the past century after growling out a complaint that it was “the worst by far ”of his calls with global figures. On a “day of diplomacy” featuring “cordial congratulations given to the new leader of the free world,” Trump’s conversation with Turnbull should have been uneventful. But the new US president blew up when the prime minister mentioned a deal that had been struck with the Obama administration to allow the resettlement of roughly 1,250 asylum seekers (mostly from Iran, Afghanistan, and Iraq) to the United States. That was the point at which Trump is reported to have—how shall we put this delicately?—lost it. According to the Time magazine report from Sydney: “The agreement, Trump reportedly told Turnbull on Saturday, ‘was the worst deal ever.’ It would get him ‘killed’ politically at a time when domestic sentiment was pushing him to secure American borders against would-be terrorists. Australia, by urging him to honor the deal, was seeking to export ‘the next Boston bombers.’” The Washington Post reported that what has been planned as a one-hour call was cut short after 25 minutes. Donald Trump’s fight with Australian Prime Minister Malcolm Turnbull confirms worst fears about American politics. Americans should be unsettled whenever their president turns a “get-to-know-you” call with a longtime ally into an international incident. But they should be especially unsettled that things blew up with Turnbull, a center-right politician whose party has been justifiably criticized for displaying insufficient sympathy for refugees and immigrants. This was not German Chancellor Angela Merkel telling Trump he was wrong about refugees; this was an Australian prime minister—who has been wrong about refugees—looking to confirm that an arrangement between two nations that might get a little bit of refugee policy right was still a go. There is no reason to believe that Turnbull was looking to rumble with the new president of the United States. That’s not this prime minister’s style. A savvy political veteran who knows how to keep things cool, he is comfortable debating with people from across the political spectrum; and he is skilled at engaging in civil discourse with dissenters and critics of his policies. Yes, Turnbull is fast on his feet. Yes, he can get the better of those who are ill-prepared and uninformed. But he knows how to do so gracefully, and with an eye toward settling disputes rather than inflaming them. That has earned him criticism from the left and the right in Australia. But Turnbull has kept the lines of communication open, at home and abroad. I know. In my other life as a writer and commentator on global media policy, I have shared platforms with Malcolm Turnbull. I’ve listened to his speeches and he has listened to mine. We have engaged in reasonably complex discussions about broadband service, public broadcasting, and coverage of politics. As I recall, he disagreed with some of my arguments, and I certainly disagreed with some of his. But he struck me as a worldly conservative who was engaged, informed, and inclined toward finding common ground—precisely the sort of international figure that Donald Trump is going to need to work with if the United States hopes to function on the global stage. During my Australian sojourn, I enjoyed the company of Malcolm Bligh Turnbull, as would any right-minded practitioner of a craft that instinctively inclines toward theatre. When we appeared together at the Walkley Foundation’s forum on campaign coverage, Turnbull was delicious. He skewered all parties, tossed off slightly naughty one-liners and oozed charm. [A tip for aspiring politicos: upon mention of the latest book by the author seated next to you, use your iPad to try to order a copy in view of said author.] Well aware that he was addressing journalists and academics who lap up intellectual pretence like cats do fresh cream, Turnbull punctuated a point about the accuracy of reporting with a quote that he just happened to have highlighted from Thucydides. Masterful performance, just masterful. And it made me very sad, as I understood that I had come upon a species that has been hunted to extinction in my own land: the quick-witted and intellectually adventurous man of the right. Turnbull’s kind once roamed the American continent in the form of modern Republicans like New York Mayor John Lindsay and Illinois Senator Chuck Percy. Today’s bright young things are not invited to the Republican Tea Party, where Thucydides, being European, would be suspected of harbouring socialist tendencies.